All the rooms are designed in such a way as to meet the developing needs of each individual child. The children are guided through a range of educational and play activities at their own pace. 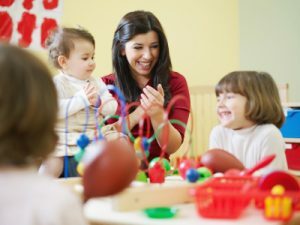 Our childcare workers create a positive and secure environment where children feel confident in exploring their surroundings. This is children who attend a 2 or 3 hour session per day. • Boys and girls are to have equal opportunity, and be actively encouraged to use all activities. • We aim to show respect for and awareness of all major events in the lives of the children and families in the service and in the wider society. We ensure every effort is taken to ensure a safe sleep and rest environment for babies and children. Babies will always be placed on their backs to sleep with their feet to the foot of the cot. Sleeping babies will be checked daily, every 10-15 minutes, by assigned staff. The sleep information will be recorded on a Sleep Chart. The routine for sleeping in the Wobbler room and Playgroup room is the children will go for a nap after dinner at 1pm for approximately an hour to two hours for the Wobbler and approximately an hour for Playgroup. Younger wobblers may need to sleep more or at different times, the team are aware of this and will accommodate the child as much as possible. Parents need to understand that eventually they will fall into the routine. For more information on rest and sleep see our full policy.